Sounds escaping from time. Like watch dogs or guards, recording devices are positioned on make shift perimeters. 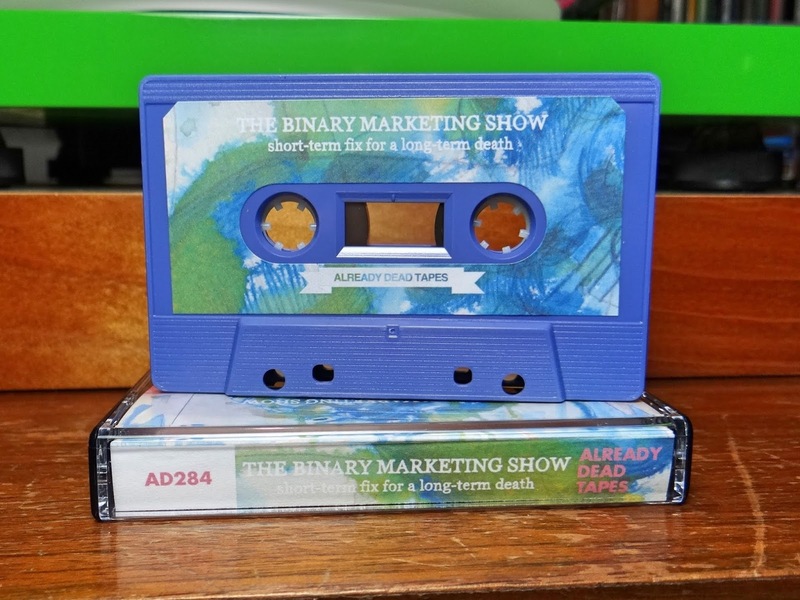 There is no struggle, sonic patterns are captured on magnetic tape or in binary form. This aural pool is full of all noises, initial vanguard cacophony sacrificed without hesitation. Soon the instruments used to keep the Hiss contained within a specific time frame will reach capacity. The machines will begin to frizzle and wail in their own mechanical way. Creating more sounds, new notes, bleeps and blurps to join the departing throng. 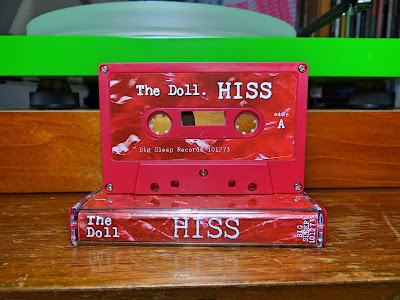 The Doll is coltish and also very sussed. 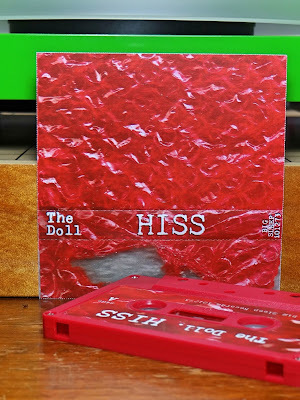 Hiss is brought to life with the most basic tools. 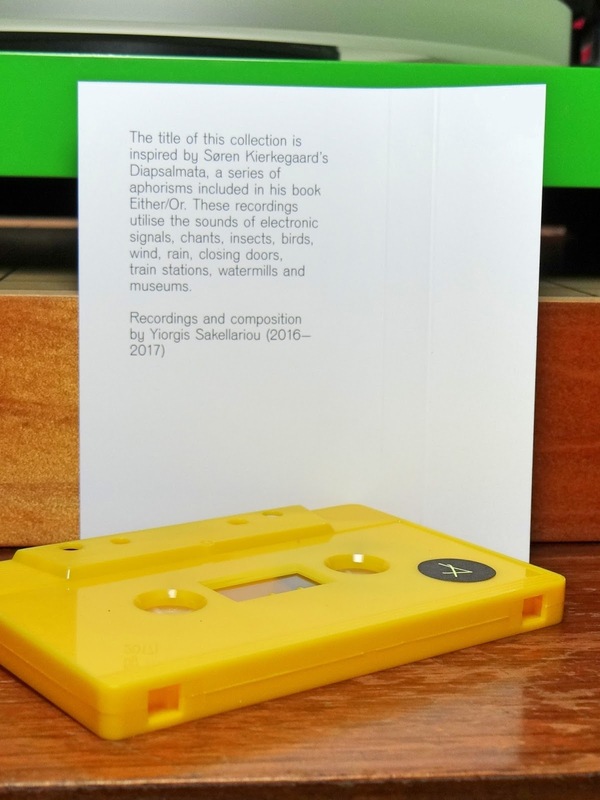 Combing melodies, noise and field recordings, listeners are pulled into a world of imagination. An industrial play ground brought to burbling life by creative force. What remained motionless and silent was bestowed energy and purpose. 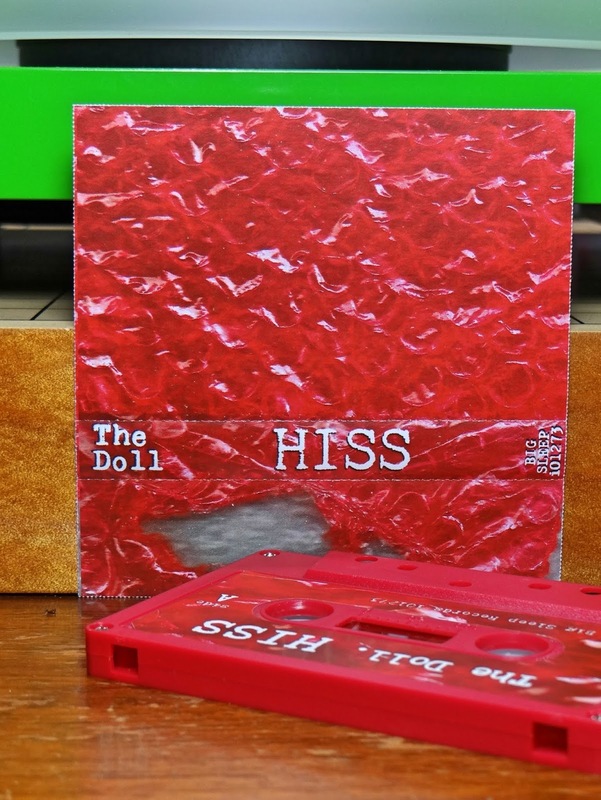 Hiss has eight tracks with mostly one word descriptive titles like, Saw, Static, Wheel, Radiator and Bubblewrap. All clues to what interest the The Doll at the time. The track Home Sweet Home combines the surrounding world in field recordings with that of The Doll. Maybe indication this artists is of our world, or at least here for a spell. 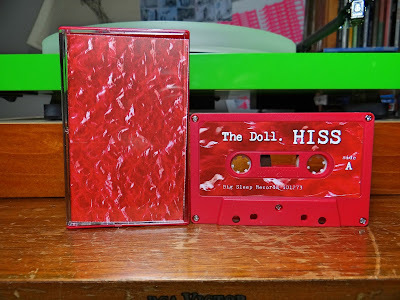 Released this month, Big Sleep Records produced fifty copies of Hiss. This is the first release for the label this year. 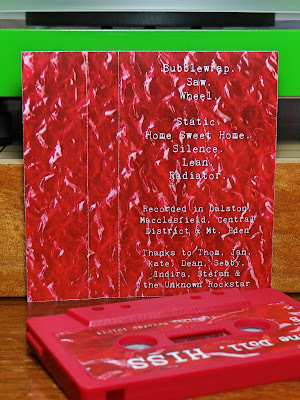 Lost in a Sea of Sound has described previous Big Sleep Records outputs here. 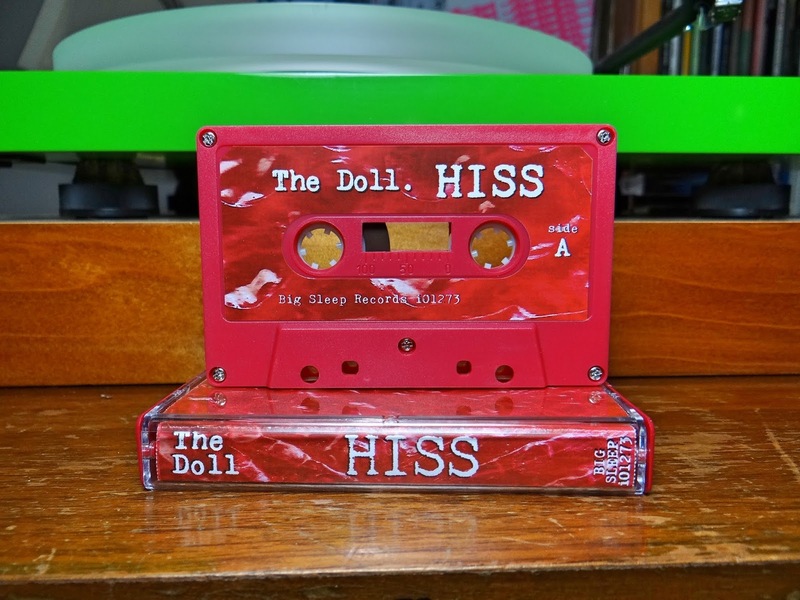 If you want to continue exploring, The Doll has many recordings on their bandcamp page ready for listening. 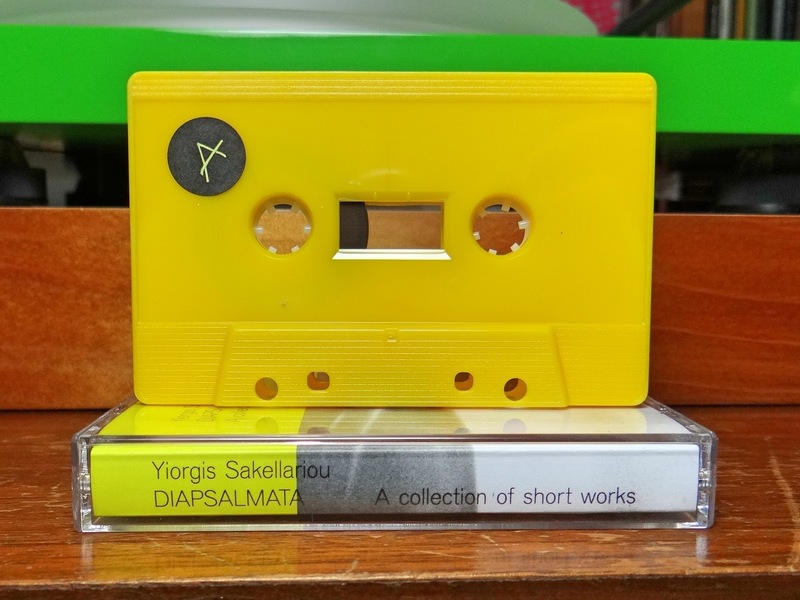 Yiorgis Sakellariou has pulled from the infinite sound pallet. A difficult endeavor much akin to a chef with a fully stocked gourmet pantry. The ability to use too much or wildly unfamiliar is very easily crossed. Reading the ingredients makes the dish sound exotic and mouth watering, but the taste is overwhelming. Yiorgis Sakellariou has not taken this path. Sound sources are very recognizable, signals, chants, insects, train stations and watermills to name a few. These are part of every day life for many people. On their own, any of these attributes can be overwhelming and caustic. How will this composition feel? 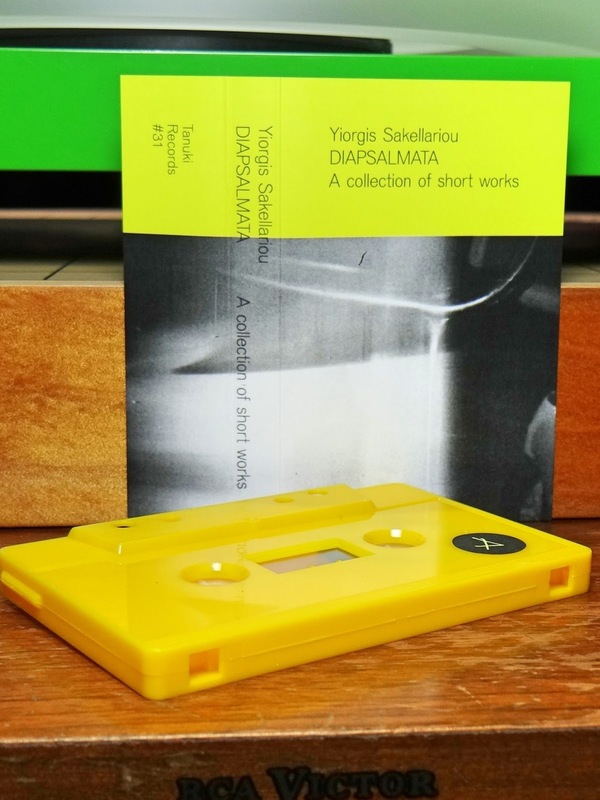 What is Yiorgis Sakellariou's purpose? Listen through Diapsalmata: A Collection Of Short Works, and then the following description may connect. An aural painting for your consciousness. Brush strokes dissolving, relinquishing their collective images in sonic euphoria and sighs. The scene dissipates leaving faint images unmasked on the sonic canvas. These exposed bones are gradually covered up by eroding factors on sound itself. Common noises, repeated in countless successions, filling the fabric life is accustomed to. Infiltrating our thoughts until each listener is in a nostalgic coma. Subdued by sounds categorized as the droning ambiance called every day existence. 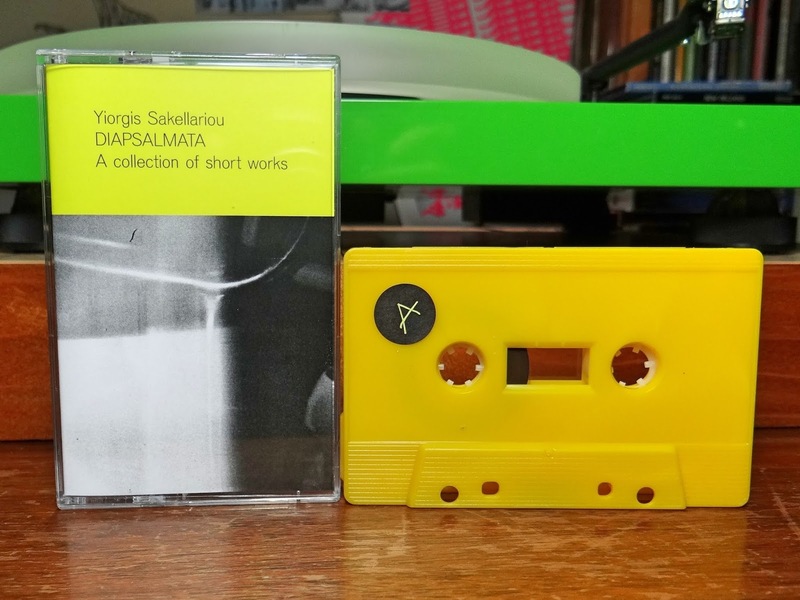 Diapsalmata: A Collection Of Short Works changes our perceptive receptors. Familiar is dismantled, soothing white noise changing alkalinity, revealing red or blue on the litmus paper. Yiorgis Sakellariou is too experienced to leave listeners at ends of the spectrum. His composition feels like the world we live in, yet purposefully shifting slightly out of phase. Resulting in a sonic nudge, a gentle push to help us understand the complexities of the world we all try to simplify. 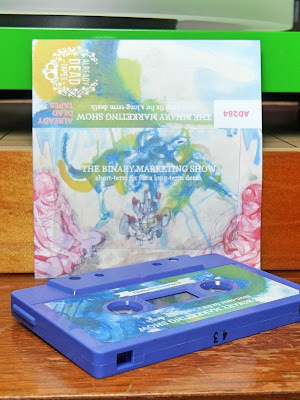 Released on the Belgium label Tanuki Records only ten days ago. Probably in the fifty to seventy copy realm from past release quantities, but this is uncertain. 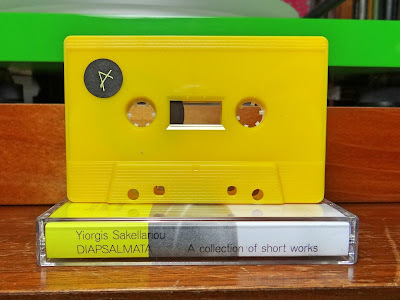 Many Tanuki Records releases are sold out, so do not push Yiorgis Sakellariou's composition off for too long. In the depths of dreams, where disjointed sounds connect for no reason, becoming revelations for brief moments then crumbling as the conscious awakes, this is a Short​-​Term Fix For a Long​-​Term Death. Folk music separated by continental drift, left to evolve over an incomprehensible stretch of time. So long, organic origins have deteriorated, dusty electronics hiss, buzz and crackle, trying to continually share a love for music a culture had progressed to. Foundations in gorgeous music making, heard through unique creativity and layers of wonderful mystery. These ten track will require repeated explorations before bearings come into focus. The Binary Marketing Show has a dream like quality, aural foundations in the fleeting moments between wake and slumber. A place of all things making sense, yet the mind smiles with feet on the table because nothing is really what you think. The really fascinating qualities of Short​-​Term Fix For a Long​-​Term Death are the illusions of sing along vocals and cadence. These attributes can be heard vividly in the fields of high wavering grass, only to be consumed by wind and rustle when any attention is turned to investigative direction. The gist of what these words are doing their best to convey is, don't think too much, only listen and succumb to beautiful creativity. Abram Morphew and Bethany Carder are making sublime sounds in a world of immediate reveal. Digital investigations fortunately can not touch their source for the love of music they cherish. Short​-​Term Fix For a Long​-​Term Death can not be explained and that is it's best virtue. Scheduled for release on Friday, June 29th. This is one of the rare occasions Lost in a Sea of Sound's words come before the release date. Excuses for not ordering a copy will be justified only from their sources. And there are two choices, the cassette, used for this write up, and black vinyl for the analog groove enthusiast. Released in quantities of one hundred and three hundred respectively. This is also a label conglomeration of New York's Already Dead Records & Tapes and Kalamazoo's Satellite Records. Crash Symbols has the connections and experience for a monumental summer soundtrack. Filled with pressure cooked beats, simmered vocals and sun drenched ambient sound waves, Touched By an Angle #2 can feed all audiences. 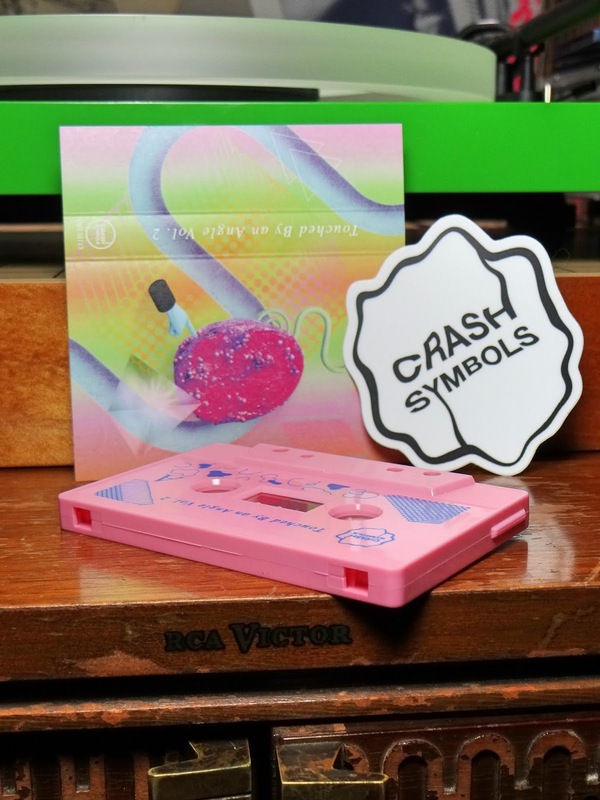 With twenty six tracks, twenty six artists, Crash Symbols has done the calculations on congruent compression and rarefaction. These artist's offerings flow with seams so gentle, there is difficulty distinguishing Touched By an Angle #2 as a V/A conglomeration in any sense. Explaining how many cassettes have sold so far. There are only a few remaining, so quit reading and get to placing an order. You need a few more descriptive words..... There is a label in California, "Bonding Tapes". 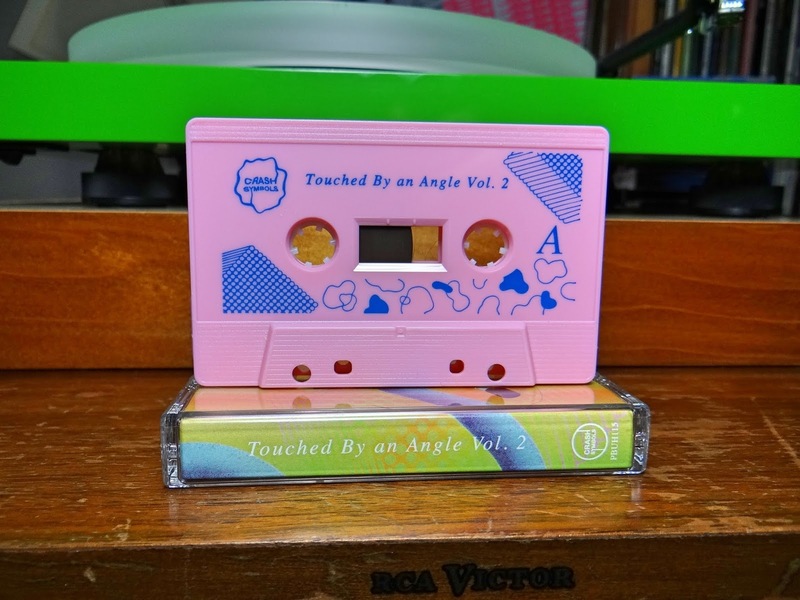 Their first release titled Quality Time Volume 1 reminded me of Touched By an Angle #2. The thickest connecting threads are an assortment of hidden beautiful beats. Where does this music come from and how do you find it? The same questions surfaced when listening to Quality Time. The process of compiling such a large array of unexplored artists rivals the difficulty of fitting their works together so smoothly. Touched By an Angle #2 is like a laser cut sonic jigsaw puzzle, once completed, suitable for framing. 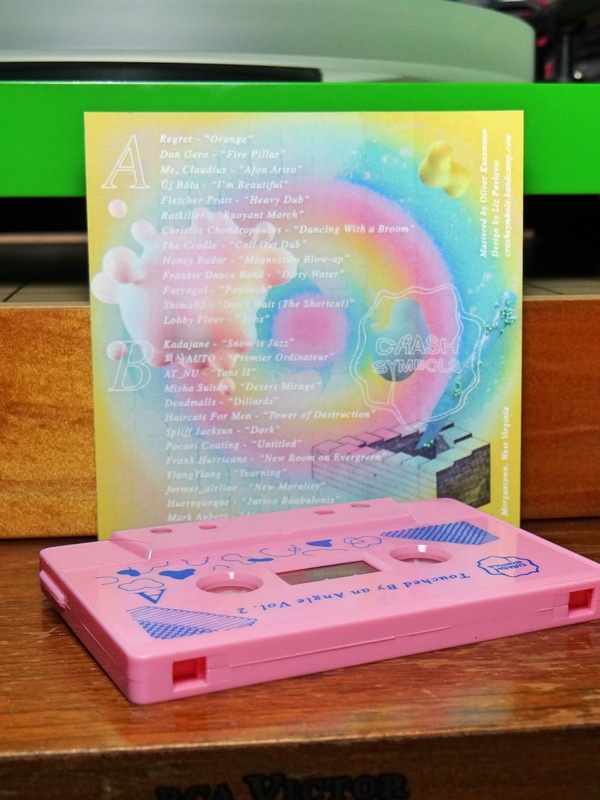 From the twenty six artists on this cassette, Lost in a Sea of Sound has had the opportunity to describe only a small handful. 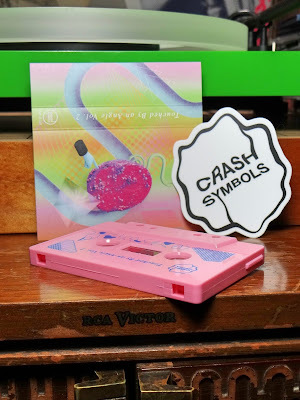 Fletcher Pratt with a previous Crash Symbols release (sold out), YlangYlang with an earlier Crash Symbols release (also sold out) and former_airline with releases on many labels. The connection for Lost in a Sea of Sound was an excellent cassette on A Giant Fern. So using the descriptive words "unexplored artists" is accurate from these listening and writing foot holds. 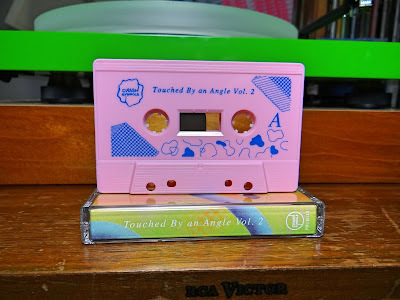 There are some new favorites on Touched By an Angle #2, but each listener will find those own their own. With such well chosen music, this will change with repeated listens. 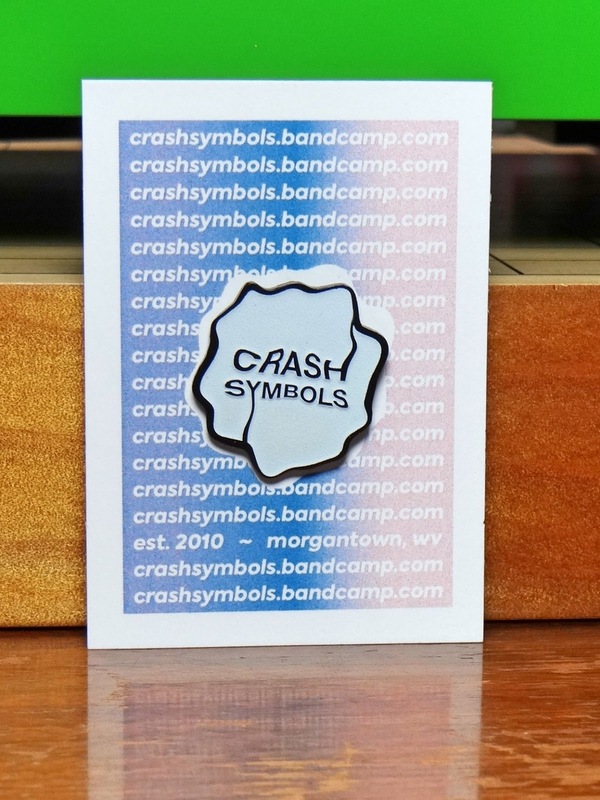 Crash Symbols also has a bundle with a high end glow-in-the-dark pin (last picture). If you have read this far, thank you! Hopefully your opportunity to grab a tape and a pin is still there. Endurance is a saturated cloud, releasing heavy ambient droplets over the past few years. Just a little over two solar revolutions ago, Lost in a Sea of Sound described City of Signals. Saying Endurance has come a long way since this early Illuminated Paths release, would be inaccurate. If you have seen the diagrams of the multiple Earths, layered slightly askew and on top of each other, all representing different but parallel words, this is where Endurance is now. In unreachable locations, alternate Joshua Stefane's have been composing sounds and transporting them to various labels around the world. 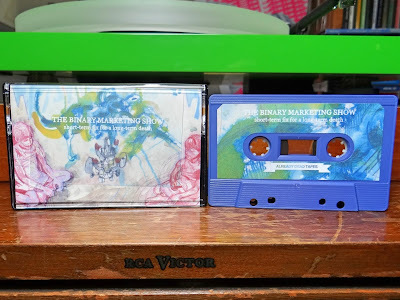 Constellation Tatsu, with their vast experience of mining the cosmos for illusive exquisiteness, has secured the transmission frequency for one of the latest Endurance releases. Shade Terrarium is a lengthy fifty minute recording, spaced out over seven tracks. Each track like nebulousities, absorbing evaporated cultural tones around altered planes of existence. Once these billows of sonic haze are imbued with the maximum amount they can take in, a gentle ambient rain begins to fall on all listeners. Each track like a passing cloud, bestowing a slightly different tone and feel. A good sound illustration of this is the track "Mercurian Umbra", there is a Gamelan undertone resonating like breathing spirits. Tracks like "Embran" and "Fluminam Ductur" have captured ambient and lost communication airwaves. Both in foreign languages from English, interwoven in the tranquilizing molecular density. "Itineranturum" must have cast shadows on City of Signals, making tones in similar aural fashion. Shade Terrarium allows fine details to be heard, the scorching solar radiance of sounds have been subdued. Released in the middle of May, Shade Terrarium is part of the Constellation Tatsu Spring Batch. 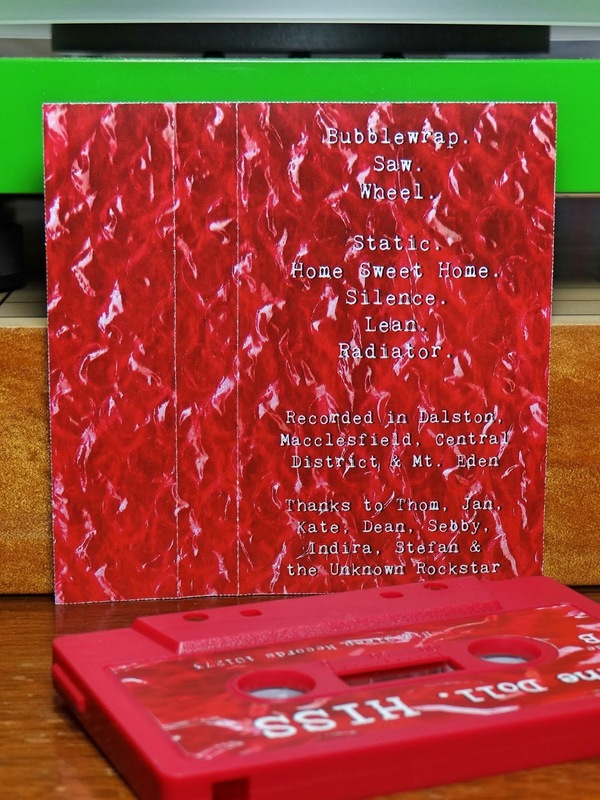 Four cassettes, each in the top of the line up in ambient splendor. 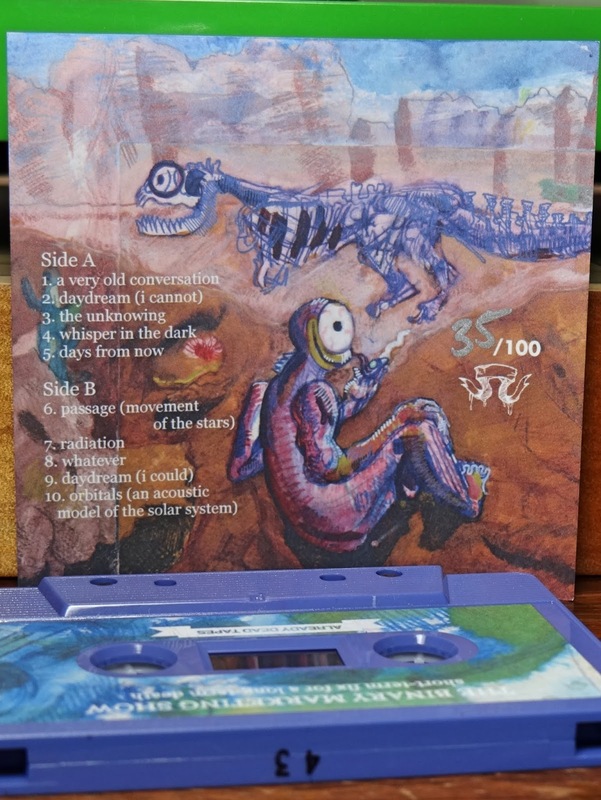 For this release, Joshua Stefane contributed both the music and artwork. The mastering was done by Sean Conrad and of course design and layout by Steven Ramsey. A very talented group making the framework for Shade Terrarium. 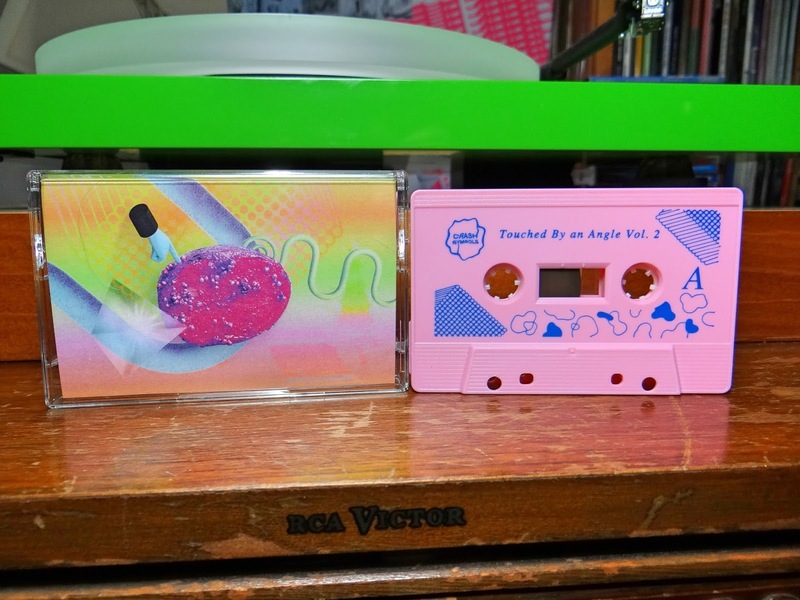 Many of Joshua's tapes have sold out, and with the Constellation Tatsu Spring Batch being so solid and popular, do not wait to long.